The Plustek OpticFilm 8200i SE - successor of the OpticFilm 7600i SE - is a low-prize film scanner fot digitizing mounted 35mm slides or 35mm film strips up to a length of 6 frames. In the delivery content there is a slide mount holder in which you can insert up to 4 mounted slides, and there is a film strip holder in which you can insert film strips up to a length of 6 frames. However, there can be scanned always only one frame, since the scannes does not have an automatic film transport. After scanning one picture the film holder has to be moved forward by one position in order to scan the next picture. Compared to the small brother Plustek Optic Film 8100 the OpticFilm 8200i SE has the hardware based dust and scratch removal integrated so that dust and scratches will be corrected effectively (only for colour pictures). The SilverFast SE Plus scan software from Lasersoft Imaging has the multi-exposure feature, where a film is scanned with 2 different exposures in order to get an optimal image result. If you only want to digitize negatives the OpticFilm 8200i SE is very good suitable. However, if you want to digitize slides (positives), you should take the bigger brother Plustek OpticFilm 8200i AI. This one is delivered with the professional scan software SilverFast Ai Studio and can be calibrated with the help of IT-8 calibration targets, so that you save a lot of postprocessing work in the image editing program. The Plustek Optic FIlm 8200i SE is a very slow scanner. As you can read in our test report about the OpticFilm 8200i, the device needs almoust 15 minutes for a scan with 7200 dpi and automatic dust and scratch correction and multi exposure. Additionally there is the time for the post processing in the image editing program. So that scanner is too slow for digitizing a complete archive of films. 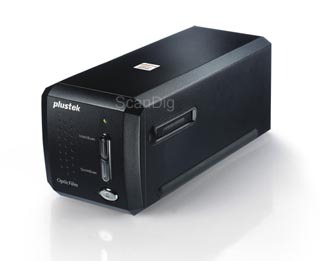 For more information, please, read our detailed test report about this scanner. You can find detailed information about SilverFast on our SilverFast website. Please, choose above, below the price information, between the SilverFast version SE Plus and SE Archive Suite. The SilverFast SE Archive Suite contains additionally to the SilverFast SE Plus software the SilverFast HDR software, so that you can create raw scans which you can process afterwards. More information about that can be found on our website SilverFast HDR Studio.